If you're trying to manage your own landscape and aren't happy with the results, it may be time to consider the benefits of hiring professionals. A healthy, well-maintained lawn and landscape requires a full time commitment that leaves little free time to spend with family and friends. By hiring professional North Carolina Landscapers, you can spend your free time on the things you enjoy and still have a beautiful landscape season after season. Take a look at some of the reasons to hiring professionals to handle all of your landscaping needs. 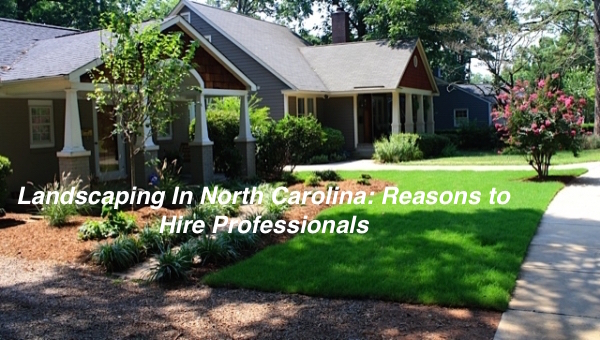 Upon hiring North Carolina Landscape Professionals, you also get professional crews with landscaping skills and experience. In addition to taking care of scheduled weekly maintenance, professional crews are trained to handle many of your landscape tasks. They're always equipped with proper tools and equipment to tackle a variety of different landscape projects specific to your property and its needs. If you're taking care of your own landscaping needs, the equipment that's required to maintain it can cost you thousands of dollars. Hiring a professional landscaping service will not only save you money on the equipment that's required, but you can also relax and enjoy time with family and friends while skilled, experienced crews do all of the hard work. 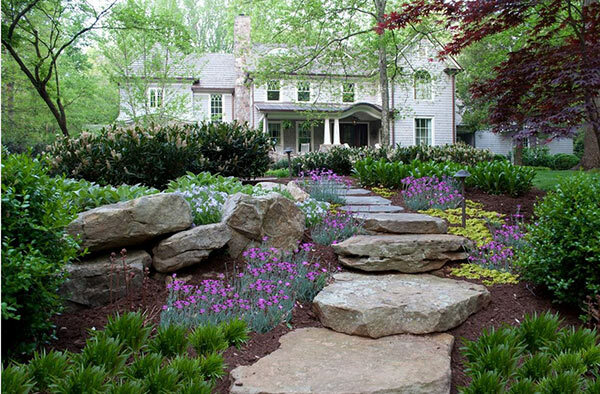 Whether you want to plant new trees and shrubs, design a beautiful flower garden or renovate an existing landscape, professional N.C. landscapers can handle the tasks. With lawn and garden renovations, you can create appealing landscape designs that enhance your home's beauty and boost your home's curb appeal, while increasing your property's value. Skilled and experienced designers can fill your landscape with colorful flowers, lush, green foliage and fragrant scent. 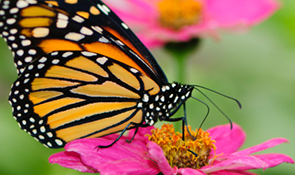 They can create beautiful annual and perennial flower gardens, specialty and woodland gardens that attract butterflies or wildlife, gardens for meditation or edible gardens where you can grow fresh herbs and vegetables. They can also create seasonal displays and potted arrangements that will enhance your home's beauty and appeal. Most North Carolina soils lack the adequate nutrients necessary for healthy turf and plant growth, so proper fertilization throughout the year is essential to their survival, and protection of your landscape investment. All lawns and landscapes require proper nutrients in order to stay healthy, lush and green, but they need the right nutrients at the right time of year. Using the wrong fertilizers or fertilizing at the wrong time of year can cause damage to your lawn, ornamental plants, trees and shrubs. Wilsons Natural Landscaping, LLC has highly trained staff that are properly educated in these areas, and can identify proper usage of fertilizers, minimizing their environmental impact. To promote strong plant root systems and healthy new growth, proper fertilization is essential, especially during Spring, Summer and Fall growth seasons. Early Spring fertilization is essential after a cold North Carolina Winter, when your lawn is deprived of proper nutrients. As warm weather approaches, plants need nutrients to produce strong roots and healthy growth. In the late Spring, weeds love to invade your lawn and soak up all of the nutrients in your soil. Proper fertilization techniques and pre-emergent products prevent weed growth and promotes healthy, environmentally safe weed control prior to their germination. Summers in North Carolina bring increased temperatures, sporadic rain fall from scattered thunderstorms, and lots of outdoor insects and pests to your lawn and landscape. Summer fertilization, pro-active applications to prevent turf disease such as Brown Patch, and moisture retaining products provide extra nutrients that help to combat heat stress and lawn diseases, and can also decrease irrigation demands- resulting in lower water bills, and decreased waste. As cooler temperatures arrive, your lawn and plants will feel the effects of cold weather much faster without the adequate nutrients essential to their growth and survival. Without these, you may notice dead patches of grass and wilted or dying plants. Fertilization, is recommended in the late fall to help your lawn and plants survive a cold North Carolina Winter. It also helps to jump start healthy new growth in the Spring. 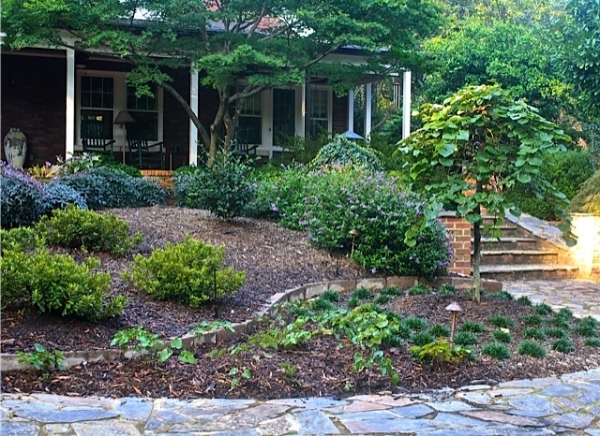 Hiring professional N.C. Landscapers, like Wilson's Natural Landscaping, LLC. 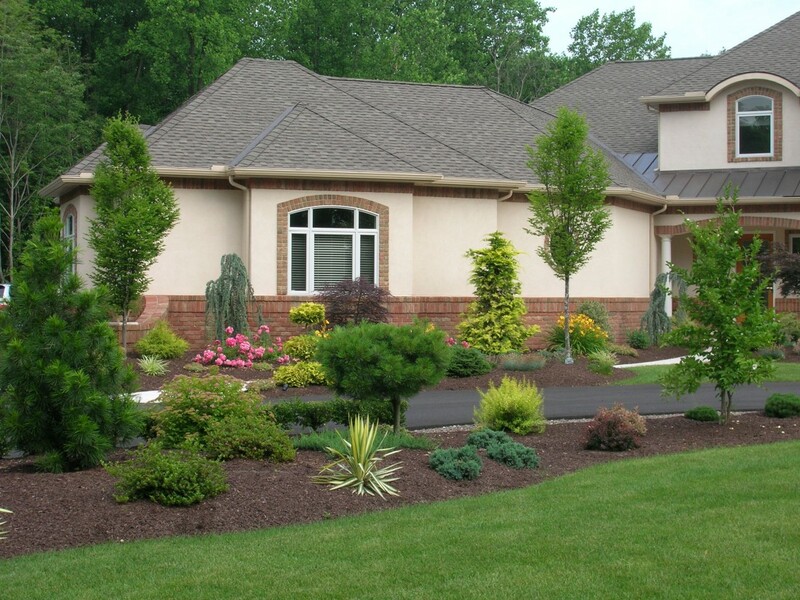 for your landscaping needs will ensure a beautiful, healthy, and environmentally safe landscape for years to come. Although taking care of your own landscape needs may seem like a good way to cut back on expenses, it can end up costing you more than professional landscape design services. Your investment in time to learn about proper lawn and landscape maintenance procedures and money to purchase the equipment and products necessary may not be worth the effort. Even if professional design services cost you a little more than the typical DIY landscape care, the benefits will be worth the difference. A lush and vibrant green lawn and a healthy, well-maintained landscape will enhance the beauty of your home and impact your home's value. Here are some of the benefits of hiring a professional landscape design service. The appearance of your landscape has a big impact on your home's curb appeal. A beautiful, lush, vibrant, and well-maintained landscape enhances your home's character while providing an inviting entrance for guests. An ill-maintained landscape with weeds or overgrown grass and shrubs gives your home a neglected, vacant appearance, and quickly diminishes its curb appeal. When it comes to your home's curb appeal, first impressions are always critical. By hiring a professional to provide landscape design services, you can turn a boring landscape into a beautiful landscape filled with lush greenery, colorful blooms, and spectacular curb appeal. You won't have to worry about the time and effort it takes to maintain your landscape or the impression it makes on your neighbors, guests, and potential buyers. With regular professional services, you can make sure that your North Carolina home has excellent curb appeal year-round. A beautiful, attractive landscape means a higher property value. This is extremely important if you're thinking of selling your home. A home with a vibrant landscape and healthy lawn can sell for up to $15,000 more than a home with overgrown trees, shrubs, and a poorly maintained lawn. According to real-estate landscape experts, a healthy landscape that includes healthy trees, a lush lawn, and well manicured shrubs can make a huge difference in the sale price of your home. Real-estate studies show that homes on tree-lined streets can sell for as much as 15 percent more than homes in neighborhoods with fewer trees. In an analysis of over 2,600 real-estate transactions over a 10 month period, researchers found that homes with a well maintained landscape sold for approximately $7,200 more than homes with an ill-maintained landscape, and also sold on an average of seven days sooner. According to the U.S. Department of Energy, properly placed trees can reduce your energy costs up to $300 each year. Planting shade trees and windbreaks in the right areas can reduce Winter heating bills by up to 15 percent and Summer air conditioning bills by as much as 75 percent. A professional landscape design company can provide expert design services and select the right trees and shrubs that will help reduce your home's monthly energy expenses. When selecting trees and shrubs for your landscape, it's imperative to know the sun and shade requirements, growth habits, and maintenance needs. If you're planting new trees in the yard or shrubs along your property line, it's important to know how large they will get when they reach their maximum maturity. A tree that gets too tall or has a large canopy that hangs over your roof can pose serious threats to the safety and security of your home and its occupants. Shrubs along your property line or driveway that spread out to your neighbors' yard when fully grown can require constant maintenance to avoid problems with your neighbors, and the protection of your assets. A landscape professional can choose varieties of trees and shrubs that will thrive in your existing landscape conditions and won't require constant care and maintenance. There are so many species to choose from, including many low-maintenance, low-water shrubs and trees that are native to North Carolina. You can replant with a variety of Evergreens for year-round greenery or add color and texture with ornamental shrub varieties that produce colorful blooms or berries throughout the year. Shrubs with deciduous or evergreen foliage are decorative, and they provide interesting shape and texture in any landscape. Your lawn requires basic care and maintenance like regular mowing and watering to stay well-maintained, but it also requires a lot more than that to stay healthy and green year-round. Keeping your lawn healthy requires attention to landscape details that can signal potential problems. You need the proper knowledge and skill about mowing techniques, soil types, plant growth patterns, sun and shade, climate and light conditions, feeding and pruning schedules and selecting the proper products specific to your existing landscape conditions. 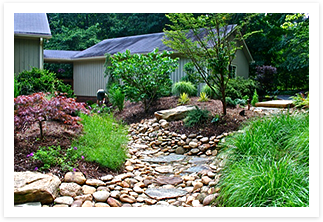 The Wilsons Natural Landscaping team has an extensive knowledge in landscape design services. They know and understand different flower, plant, shrub and tree varieties and their growth patterns throughout the different seasons. They are also knowledgeable about the different types of of pesticides and herbicides, fertilizers and fertilization schedules, proper pruning techniques; lawn and plant diseases, outdoor pest control and proper irrigation and drainage, along with each one's environmental impact. 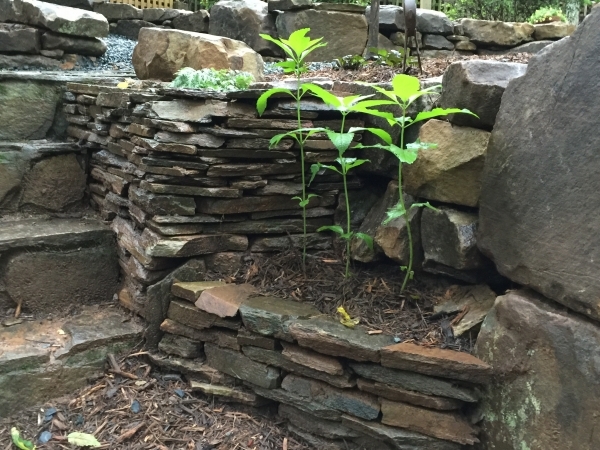 Professional knowledge and expert care from Wilsons Natural Landscaping, LLC means a healthier, greener landscape for you and your North Carolina home. The benefits of using professional landscape design services are endless. You can spend your free time with family and friends instead of mowing the grass and trimming the hedges. 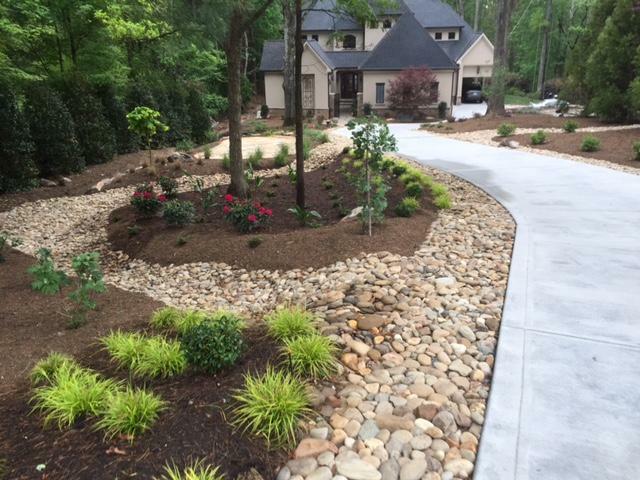 With professional landscape design services, you can make sure that your North Carolina landscape stays healthy, green and well-maintained year-round. Natural Stone Hardscaping is one of the most beautiful elements that you can incorporate in to your yard. Whether you're looking for a new hardscaping material to incorporate in to your space or starting from scratch on your very first hardscaping project, natural stone hardscaping is at the top of the list for best choices. Take a look at some of the benefits of using Natural Stone in your hardscape. Natural stone walls, patios, stepping stones, and boulders are the architectural and functional features of our landscape design and installations. They underscore our design approach which is to use sustainable, natural materials. Natural Stone products blend beautifully with the colors and shapes of outdoor spaces without an artificial or harsh look. While natural stone can be costly if you have many projects and accent features planned, it can adapt to a wide variety of budget needs. Natural stones can range in price, so less expensive stones are ideal for larger scale projects or smaller budgets. Concrete and asphalt can crack and chip over time, leading to unsightly patchwork and re-surfacing jobs, which can put a dent in to your pocket quickly. Most people have to repair their concrete and asphalt every five years. If you're considering Natural Stone, the benefit of spending money up front on a Natural Stone project offers you a great return on your investment. Natural stone is hard and organic, so it will last a lifetime in the elements. The need for repair jobs and patchwork of concrete cracks go are eliminated, which equates to more money in your pocket. These products are available in a wide range of colors to suit your preferences and design goals, and they are one of the most beautiful building materials used throughout time. Wilsons Natural Landscaping, LLC. 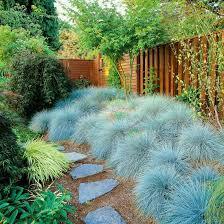 provides professional landscaping design for you throughout the year. We have worked on thousands of projects in the landscape design field and have a staff of trained experts in creating sustainable, functional, economically and environmentally friendly landscapes. Our designers work with you one on one to make sure that you end up with a finished product that you love and will enjoy for years to come. If you want to take the appearance of your home to the next level, the first thing to consider is all of your landscape efforts. If you have been following the same concepts over and over again, it may be time to switch it up and step outside of your comfort zone. At Wilson's Natural Landscaping, LLC we are confident that you will be amazed at how a few simple additions can transform the look of your property. In landscape design terminology, focal points for the viewer's perspective to a particular location. This "focalization" gives a landscape design a sense of purpose and order. Without this, a landscape is just a careless collection of plants, other objects, and empty space. The use of symmetry creates the affect in an obvious manner, while asymmetrical can soften and serve as an aid to avoid focalization. 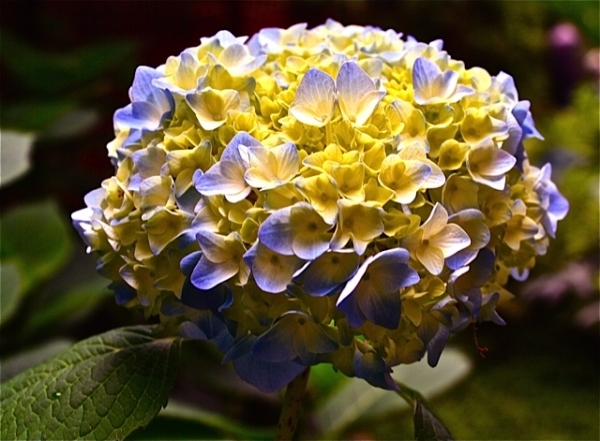 For example, it is common to create symmetry at the front of your home, especially using shrubs. Such an attempt can sometimes come with it's drawbacks. What happens when the growth of a shrub outstrips that of the other? Even if you keep them on an even footing via pruning, this creates more landscaping maintenancethan you desired in the long run. See our Horticultural Management page. 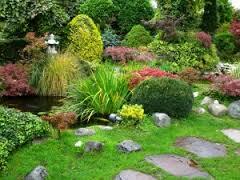 Every landscape must have focal points in to their front or backyard, they often times thing of items like trees, water features, gazebos, and statues. 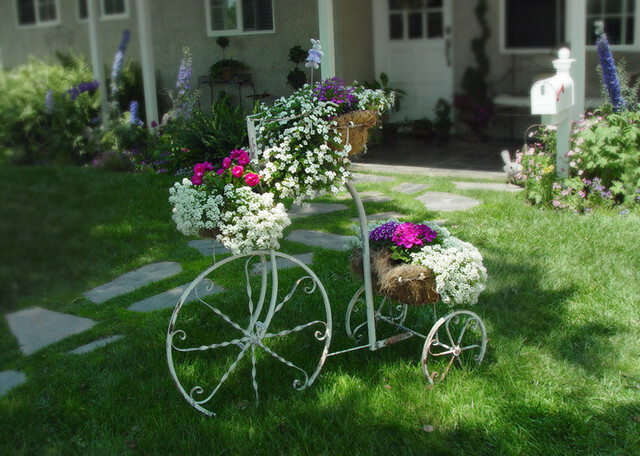 There are plenty of other items you can use in your yard as focal points. A good rule of thumb is to use items that are slightly different from the rest of your property. In other words, they don't match, but they grab your attention. 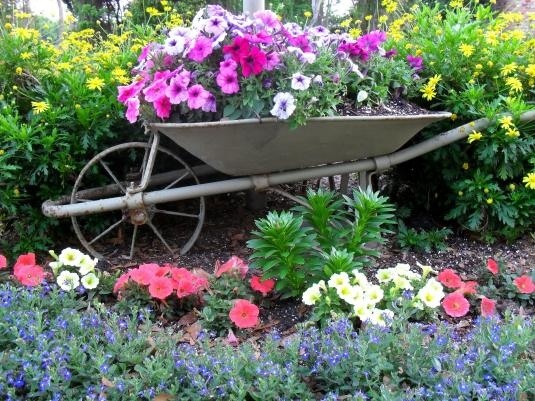 Items like an old bicycle with planter baskets, an old wheel barrow, and a wagon wheel. When a landscape plan is a jumble of accents (each installed with the purpose of creating a focal point), the purpose of creating that focal point is defeated. By definition, focalization involves discrimination. You will not draw much attention to A if you have indiscriminately set up B, C, and D as competition. The human eye can only pay so much attention to an object at any one time. Sometimes an intended focal point does not work because it fails to draw attention, but because it attracts too much attention. For example, a tree that is not in-scale with the house that it is planted next to will draw excessive attention. We certainly notice the tree, but we also notice how small the house is, which is a property feature most people do not wish to draw attention to. We are currently coming out of thick of the Winter season here in North Carolina. Although you have to wait a few more months to plant your favorite flowers and shrubs, it is never too early to start planning. It is a good idea to start mapping out your landscaping design ideas for the Spring months. 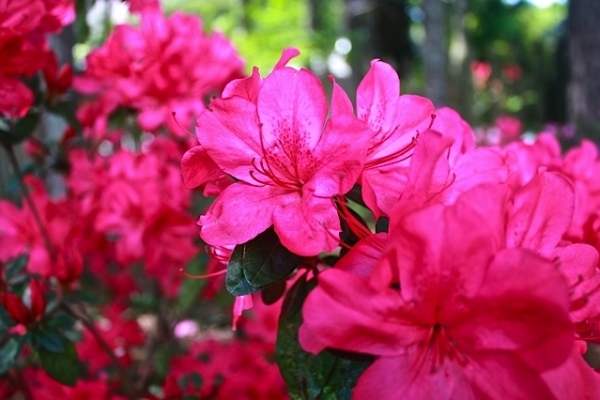 You can decide now where you would like to install your flowers and shrubs. If you a planning a landscape design project on a larger scale, you can Contact Us now to begin The Landscape Design Process. 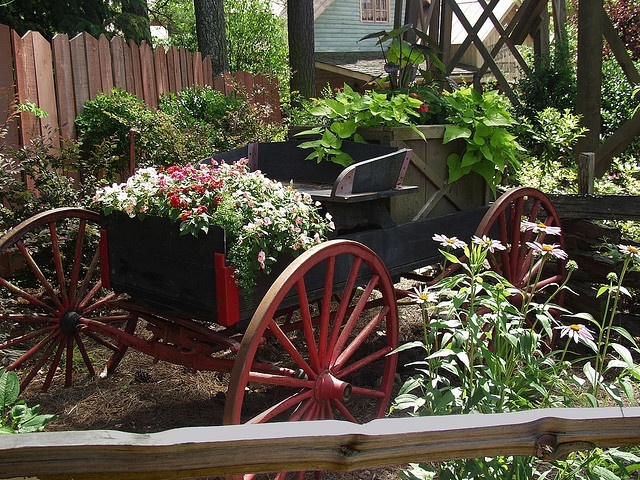 Wilson's Natural Landscaping, LLC is built on a strong team of plant professionals. When you are seeking to create an ecologically correct, low maintenance, and highly sustainable landscape, call Wilson's Natural Landscaping, LLC. 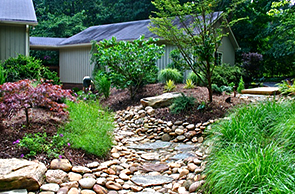 Our team of experts will determine the style of landscape and features you want before designing your custom landscape. During the Winter months in North Carolina, landscape maintenance is probably not at the forefront of your mind, but you should consider some of the benefits to pruning your trees and shrubs in the cooler, Winter months. Visibility, Pre-mature growth, and Energy Reserves all play a huge factor when considering pruning in the Winter. Because most of your plants are dormant during this time, it's healthier for them as it lessens the chances of disease and insect infestations at your point of cuts. Although it is cold outside, this will prepare your trees and shrubs to grow and thrive in the Spring. When there are no leaves or flowers on the branches of your trees and shrubs , it's much easier to examine their form and structure. During this time it is much easier to see if there is any branch damage or disease that needs to be addressed. Trees and shrubs are also much easier to hard prune when there aren't any leaves, foliage, and flowers obstructing your view. When you choose to do your last pruning before the Winter months, in the late Summer or early Fall, there will still be enough time for your trees and shrubs to grow, but not harden before the Winter. In the Winter, because the trees and shrubs are dormant, you won't have to worry about this type of growth. When you prune in the Winter, you are giving the branches some time to store up extra root and energy reserves for the upcoming Spring months. These energy reserves will help them heal wounds quicker, and grow stronger. Although Winter in North Carolina is a great time of year to prune, for all of the reasons listed above, it's important to listen to the needs of your trees, shrubs, and plants. If you have the type of plants within your landscape that respond better to pruning at a different time of year, you should schedule to do that type of routine maintenance during that specific season. It's always a great idea to ask yourself before you make any cuts, "why am I removing this branch?" This ensures that all of your pruning is intentional and purposeful, limiting the damage to your trees, shrubs, and plants. 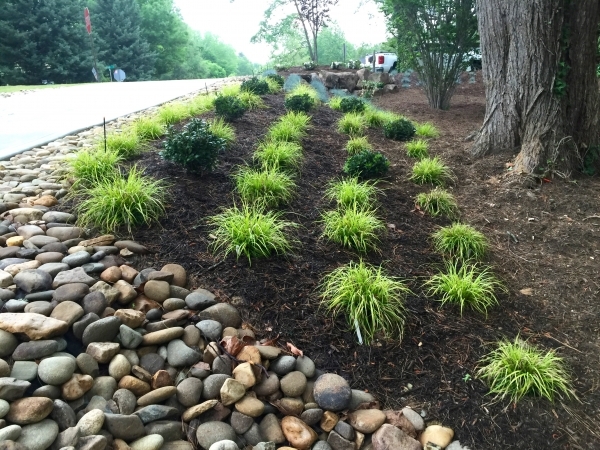 At Wilson's Natural Landscaping, we offer an ecologically correct and sustainable approach to landscaping that consistently delivers satisfying results. Taking an organic approach does much more than simply providing a healthier landscape. Choosing organic over synthetic care methods can be beneficial in other ways that you may not be able to identify as easily. Here are some of the reasons why going organic is your best option. Although organic products can initially cost more than synthetic products, going organic will actually save you money in the long run. The organic and ecologically correct products and services that Wilson's Natural Landscaping offers promote natural, healthy soil and root development, which reduces the need for herbicides, pesticides, and fungicides later on. Most of the time, a healthy plant can effectively fight off pests and diseases on their own. This means that ongoing, organic feedings and treatments will ultimately cost you less than the synthetic alternatives. Along with the cost reductions associated with choosing organic care, ecologically correct methods also provide significant environmental benefits. Synthetic products can be washed away and end up polluting storm water systems, and ground water used in wells. Synthetic methods also kill off many beneficial insects such as Ladybugs, which typically prey on pests that can damage your lawn and plants. Choosing to go with the Wilson's Natural Landscaping approach, that is environmentally friendly and ecologically correct, can eliminate unwanted pest, and can keep your drinking water unpolluted. At Wilson's Natural Landscaping, we pride ourselves on a landscaping approach that is safe for the environment and your entire family, including pets. This means avoiding the use of chemicals that can potentially cause health issues. Wilson's Natural Landscaping only uses natural ingredients and products in our lawn and horticulture treatments, which have no adverse health effects.